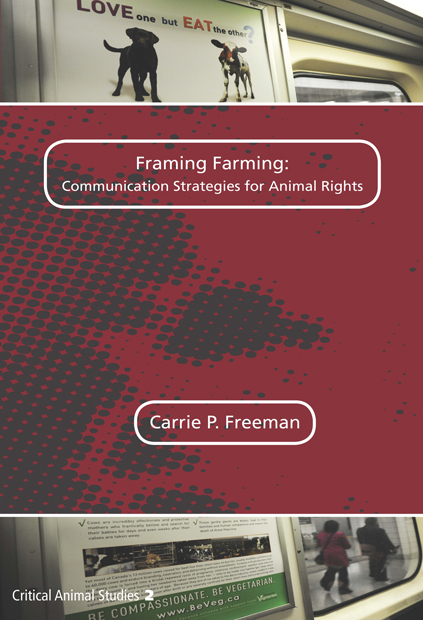 In the peer-reviewed 2014 book Framing Farming, media scholar Carrie Freeman provides a unique study of the U.S. animal rights movement's 21st century "go veg" campaign messages, with the goal of helping public discourse begin to question if it is fair to farm anyone. Don't all animals (human and nonhuman) deserve the right to life, liberty and the pursuit of happiness? Smart people who like important books that can inspire change. As a blind, peer-reviewed scholarly book, it is appropriate to use in both graduate and undergraduate classes. ﻿Framing Farming questions the extent to which animal rights activists should promote animal rights when attempting to persuade meat-lovers to stop eating animals. Through a unique frame analysis of vegan campaign materials (from websites, to videos, to bumper stickers) at five prominent U.S. animal rights organizations, and interviews with their leaders, including Ingrid Newkirk and Gene Baur, Freeman answers questions, such as: How is the movement defining core problems and solutions regarding animal farming and fishing? To which values are activists appealing? Why have movement leaders made these visual and rhetorical strategic choices – such as deciding between appealing to human self-interest, environmentalism, or altruism? To what extent is the animal rights movement actually challenging speciesist discrimination and the human/animal dualism? Appealing to both scholars and activists, Framing Farming distinctively offers practical strategic guidance while remaining grounded in animal ethics and communication theory. It not only describes what 21st century animal rights campaigns are communicating, it also prescribes recommendations for what they should communicate to remain culturally resonant while promoting needed long-term social transformation away from using animals as resources.